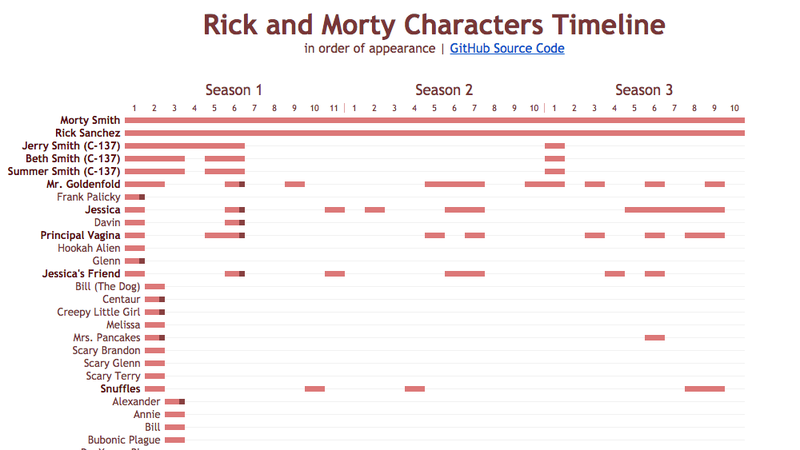 After three seasons of alternate timelines and deep-cut callbacks, the Adult Swim comedy Rick and Morty is complicated enough that you might need to consult this character timeline chart. It tracks every significant or named character from the series so far, marking their appearances and deaths. The show takes place in multiple dimensions and on multiple levels of reality, so most recurring characters are actually different entities in different episodes. For the main cast, the chart treats each instance as a separate entity, but side characters like teacher Mr. Goldenfold are treated as one character, even after dying onscreen and appearing in alternate dimensions. It's a bit inconsistent, but it's necessary to keep the chart from sprawling beyond all comprehension. For more character timelines, try xkcd's "movie narrative charts" of Lord of the Rings, Star Wars, and Jurassic Park, three charts outlining Back to the Future, or nine charts teasing out the Gordian knot of time-travel drama Primer. Really needs better colour coding. It's becomes less comprehensible the further down you look. oh cool, even includes Mrs Poopybutthole and Baby Poopybutthole from the season ending show's credits!